Dr. Michael Temkin (San Ramon) - Book Appointment Online! If you’ve ever felt like just another chart in a busy day at the doctor’s office, you’ll appreciate Dr. Temkin. He has that great combination of medical expertise with a kind, caring spirit and dedication that are instantly recognizable. 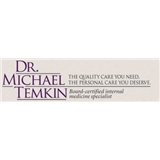 Visits with Dr. Temkin are totally focused on you. You’ll have his full attention and be able to talk with him about all your health concerns. He’s here as your sounding board, to answer your questions and help you take an active role in your good health. Whether you need to talk with him on the phone or need a little extra time to discuss a personal issue, Dr. Temkin is always here for you. This involved, personal approach can definitely help you feel at ease, and it’s a big part of what makes Dr. Temkin so special to his patients – but it’s also key to making sure you’re getting the most appropriate, complete healthcare possible. Dr. Temkin was AMAZING! He had answers to all my questions, made me feel comfortable the entire time and didn't rush me once. He not only had answers to my questions, but explanations and was willing to discuss anything I wasn't comfortable with. I am beyond pleased with his professionalism and with certainty can say that I've found the doctor I'll be sticking with.